LONDON, ENGLAND - APRIL 11: After weeks of speculation Wikileaks founder Julian Assange was arrested by Scotland Yard Police Officers inside the Ecuadorian Embassy in Central London this morning. Ecuador’s President, Lenin Moreno, withdrew Assange’s Asylum after seven years citing repeated violations to international conventions. The charges, which were inadvertently made public in November 2018 during a filing error, were filed in the Eastern District of Virginia federal court. Assange is charged with conspiring with Chelsea Manning to crack the password of a U.S. Department of Defense computer that prosecutors say was connected to the government’s classified documents system known as Secret Internet Protocol Network (SIPRNet). If convicted, Assange faces up to five years in prison. 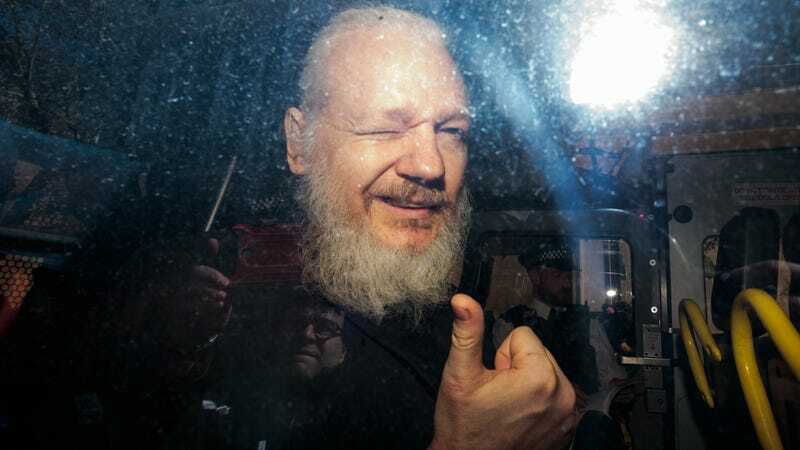 Assange has reportedly been found guilty of skipping bail in 2012, despite the fact that his lawyers argued he had every reason to seek asylum and was “absolutely right” in his suspicions. Assange’s extradition hearing will take place in four weeks. Several press freedom groups expressed concerns that Assange would be extradited to the United States. The Obama administration had previously decided not to pursue charges against WikiLeaks, but the Trump regime has obviously reversed course. “Any prosecution by the United States of Mr. Assange for Wikileaks’ publishing operations would be unprecedented and unconstitutional, and would open the door to criminal investigations of other news organizations,” Ben Wizner, director of the American Civil Liberties Union’s Speech, Privacy, and Technology Project, said in a statement posted to the ACLU’s website. “It’s called a conspiracy to commit journalism,” Kristinn Hrafnsson, the current editor in chief of WikiLeaks, said during a press conference outside the courthouse. “This precedent means that any journalist can be arrested for prosecution in the United States for having published truthful information about the United States,” WikiLeaks lawyer Jennifer Robinson said, standing next to Hrafnsson.